I was recently asked by a Japanese if we had dandelions in the UK and certainly we do. 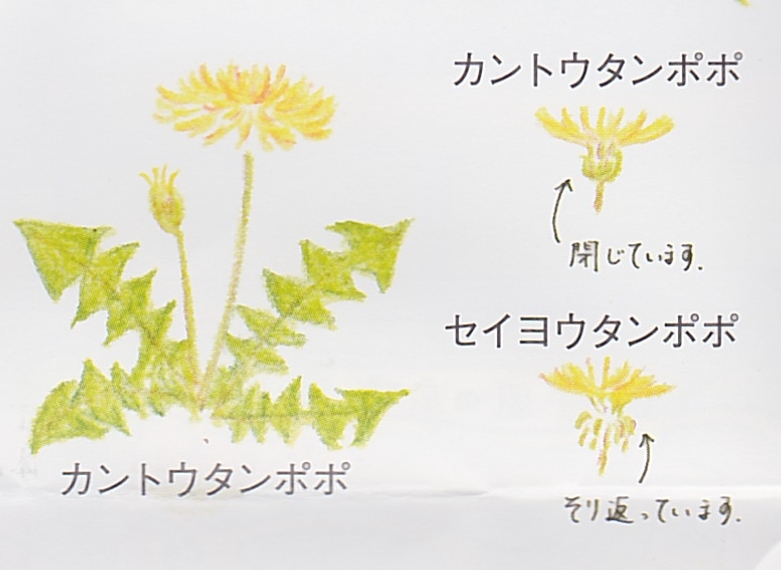 The picture on the left shows a close-up of a local dandelion which has the delightful name of tampopo in Japanese. Tampopo is the child's word for a small hand-drum (tsuzumi) and came to be the general word for the flower during the Edo period. On a recent visit to Sayama Park in Higashiyama City, I learned an interesting difference between the Japanese and Western versions from the park pamphlet. Two kinds of dandelion are illustrated in the pamphlet (below): Kantō-Tampopo (Taraxacum platycarpum or Korean dandelion common in the spring months) and the Seiyō-Tampopo (Taraxacum officinale or common dandelion - literally Western dandelion - seen in Japan in the summer). The illustration in the pamphlet highlights the fact that on the former the ring of leaves under the flower-head is tightly closed (tojiteimasu = 閉じています）, while on the latter they are turned downwards/bent backwards (sorikaeteimasu = そり返っています, literally "thrown back", as in to throw back the head, shoulders etc). As a final aside, one of the all time classic Japanese films is also called Tampopo (1985). Directed by the legendary director Itami Juzo, it is difficult to categorise but is basically a comedy not about flowers but (Japanese) food, especially ramen (Chinese noodles). Tampopo is the name of the female noodle restaurant owner. The film was restored and re-released last year in spectacular 4K - check out the trailer here.